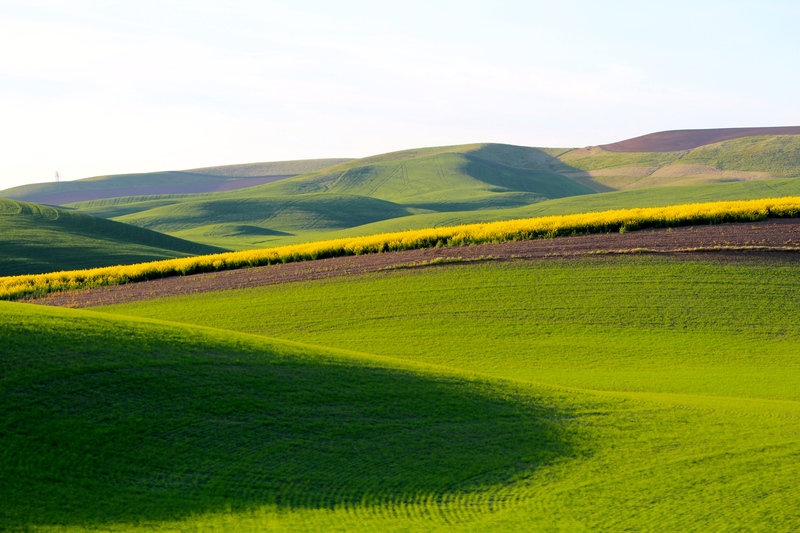 Spring comes to the Palouse | Oh, the Places We See . . . The Palouse is almost spiritual. You can ride for miles among the rolling hills carpeted with the greatest expanse of wheat and grains in the U. S., taking note of a horizon that seems to move fluidly toward clear blue skies of puffy clouds. Or you may be awed with the expanse of sky — gray ceilings filled with impending storminess. Sometimes you wonder why anyone would live here with farmhouses so far apart. We drove for miles before we sighted men on harvesters or sheep grazing behind tattered barns. It didn’t matter. We were drawn to the quiet and the mesmerizing flow of the topography. We crested hills only to spill into valleys of flowing farms and colorful crops — a place for solace, production, and scenic beauty like no other place in America. Located south of Spokane, Washington, the Palouse extends through eastern Washington, western Idaho, and parts of eastern Oregon with about 3,000 square miles of crops planted in swirling patterns. 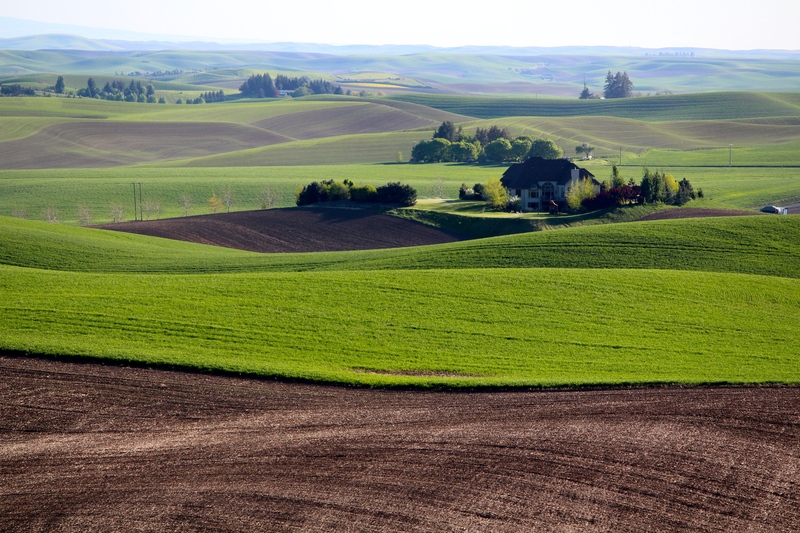 With questionable derivation, the name “Palouse” may have evolved from the French word pelouse meaning “lawn,” but to us, the land means so much more. 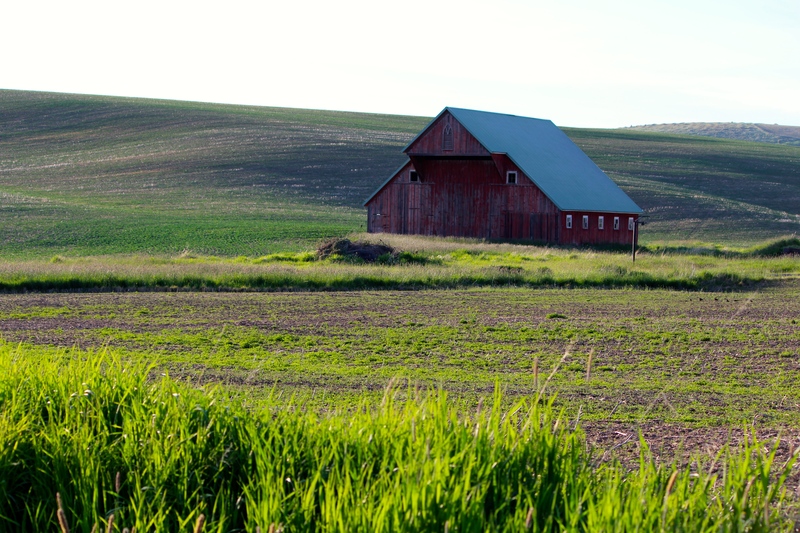 The Palouse is productive, “greening up” in the spring, pushing out grains and legumes in summer, then yielding to the harvest in its golden state. The fields and their holdings remind us of Robert Frost’s “Nothing Gold Can Stay”: Nature’s first green is gold/ Her hardest hue to hold. And even though it was our third trip, we were seeing spring for the first time. If you ask which view we prefer — autumn harvest, winter snow, or spring green — we won’t be able to tell you. In this odd land of silt dunes formed during the Ice Age, all seasons greet you differently but in ways you won’t forget. Colors touch each other as curved fields offer complementary form and function. Occasionally, a barn or abandoned building or farmhouse interrupted the landscape, and we grabbed our cameras in an effort to capture life as it is on the Palouse — sometimes vibrant, sometimes fading as time takes its toll in its own unhurried way. Spring has a newness about it as colors touch colors: the pure green of wheat, lime green of garbanzo, and brilliant yellows of canola. A symphony of new growth. We make note of animals, too — an occasional magpie on a fence or big-horned sheep in a field or an Arabian horse carrying a solitary rider home for the night. The sighting of an Appaloosa reminds us of who was here before — Palouse Indians who lent their name to the beautiful spotted creatures we point to on the landscape. You can see the Palouse driving I-95 between Coeur d’Alene to Moscow, Idaho, but we prefer the not-so-beaten path. We begin in Lewiston, Idaho, and drive north on Hwy. 195 through Uniontown, Colton, and Pullman. Then we head up Hwy. 27 to Palouse, west to Colfax on Hwy. 272, and north to Rosalia on 195. 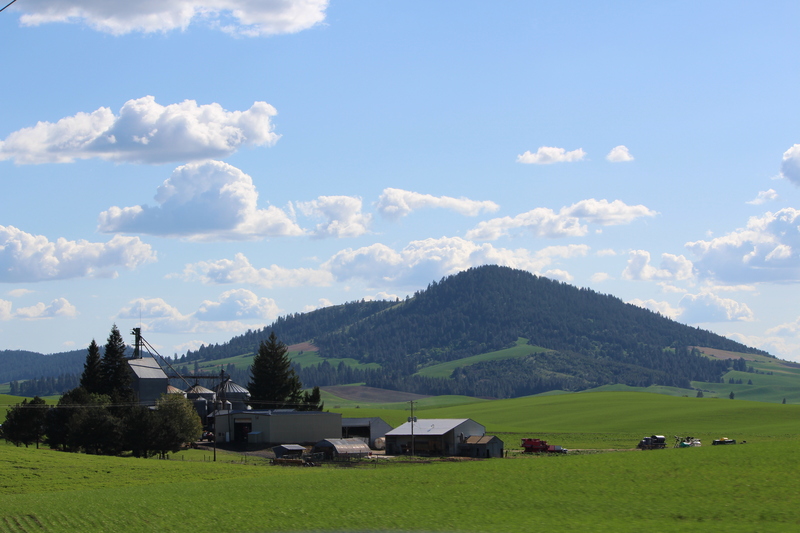 Besides enjoying the coffee shops and vintage goods in the small towns, you can walk a forest path at Kamiak Butte near Palouse or take the winding road to the top of Steptoe Butte off 195 near Steptoe. No two trips are the same. Varied crop plantings and ever-changing shadows at sunrise and sunset create new pictures with each journey. And for us who are only passing through — it makes us want to come again. At any season. For a previous post on the Palouse entitled The Palouse, Amber Waves of Grain, click here. To see more of our posts on the Inland Northwest, click the Inland Northwest page at the top of this blog. This entry was posted in Destination, Idaho, Travel, Washington and tagged Appaloosa, barns, canola, Eric Sorensen, Inland Northwest, Kamiak Butte, MaryJane Butters, Palouse Scenic Byway, Steptoe Butte, The Palouse, wheat. Bookmark the permalink. Thanks! I really, really loved this area. Wondering how I can get back for harvest time. Appreciate the comment. We hadn’t heard of it either until a year ago. Where have I been? This is the loveliest farm country in the US — or at least we think so. Thanks for reading! 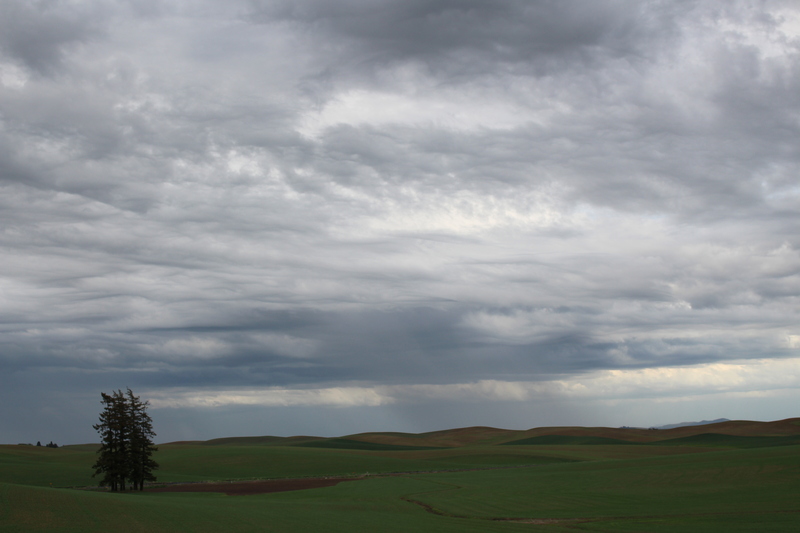 Pingback: Photograph the Palouse (or anywhere really): Tips from the pros | Oh, the Places We See . . . Thanks for your comment. I hope you get to travel through it sometime. It’s absolutely beautiful — an American treasure. Gorgeously written and photographed, Rusha. Thank you! You are so welcome. We spent almost three days there counting one day when I worked in Deary. I must admit, this is the prettiest farmland I will ever see. Mesmerizing!